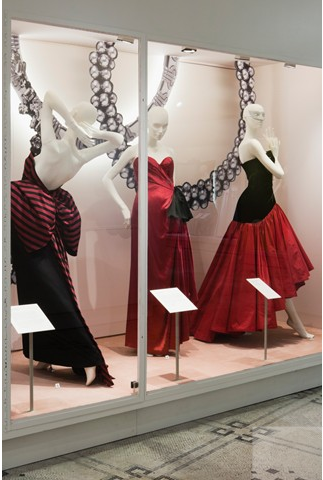 Recently, I went to see the new exhibition at the V&A Museum - Ballgowns: British Glamour Since 1950. I had been looking forward to seeing this, and when I recently bought membership for the V&A, I decided that this would be my first exhibition with my fancy new card. 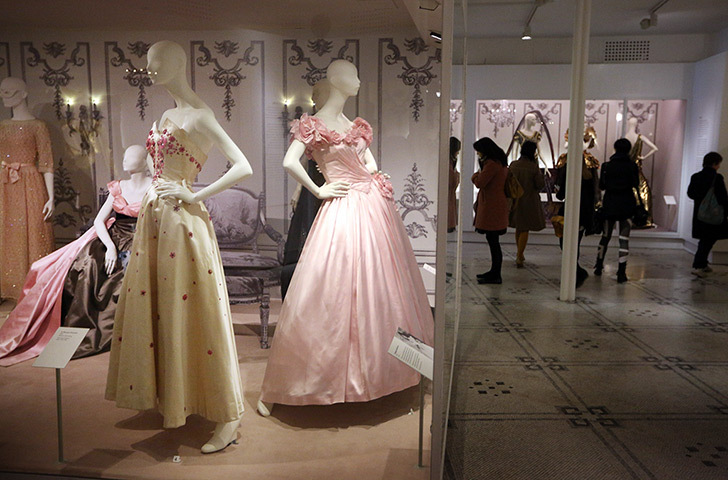 There were some delightful dresses and I really enjoyed the way that they had chosen to curate the exhibits. Instead of going chronologically or some other such way, they grouped together dresses by colour palette. It was fun to see dresses from, say, the '50s, '70s and '80s side by side with almost exactly the same shades and combinations of colour. Corals. 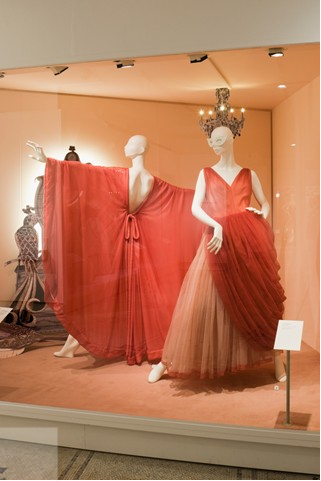 I was fascinated by the kaftan dress on the left. holding the sides together. Would be quite fun to wear, I think. Despite all the lovely vintage dresses downstairs, I have to confess that I would have been slightly disappointed if I'd paid to get into the exhibition. It felt rather thin somehow. I think my main complaint would be the lack of interpretation. There was hardly anything to put ballgowns into context or to chart their development - the information boards could basically be summed up in one sentence: "People used to wear ballgowns to debutante balls and other such events, now celebrities wear them on the red carpet". 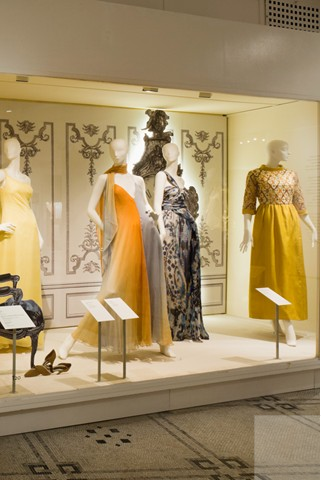 A few select dresses had further information but I felt that so much more could have been said to draw out the viewer's appreciation and understanding of the dresses and how fashions have developed. As it was, it just felt kind of like window shopping... Except I couldn't walk in and try any of them on! I was also frustrated about the lack of mirrors in some of the display cases. 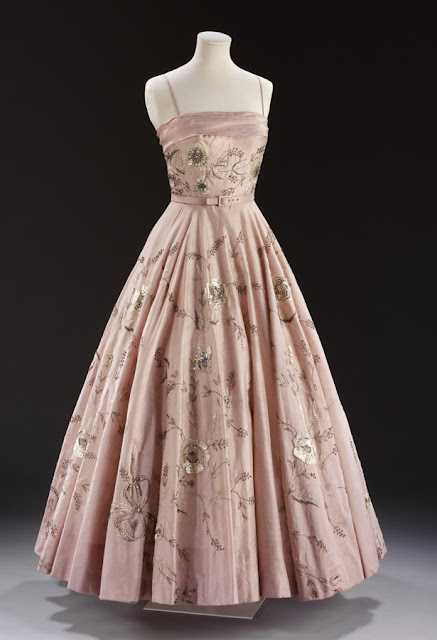 There was one amazing 1950s dress with some lovely detailing around the waist - I would have loved to have been able to see how it was constructed at the back and a well-placed mirror would have enabled that. I think such simple measures might have encouraged more overall appreciation of the dresses' structure and craftsmanship. So, despite some undoubtedly lovely dresses, not necessarily one to hurry off and see. The recently re-opened fashion galley is looking great though. I only had a quick look around the permanent exhibits but will be going back for a proper visit some time. And I will also return with a review of the V&A's other current exhibition British Design 1948-2011 once I've been to that. I've heard good things about it from a couple of workmates so I'm looking forward to it. that's such a shame about the exhibit, I was planning on going to see it but sounds quite pricey for what is there. I'm still going to make a trip up though, want to go scout out the fashion section, wasn't open last time! Please let me know what you think of the design exhibition, that's another one on my list! and next time you're in the area, I'd recomment the Bauhaus exhibit at the Barbican. I do love a bit of Bauhaus! Oh, the Bauhaus exhibition is brilliant! I'm a big fan of Bauhaus too - have been to Weimar and Berlin and planning to go to Dessau someday soon I hope... I was intending to write review about that exhibition too, actually, when I can get my overwhelmed thoughts together! And I will definitely share my thoughts on the design exhibition with you once I've been. I Love the last dress! Perfect! Interesting comments you made about what was lacking in the exhibition. Reminded me of the Grace Kelly: Style Icon which I saw in Bendigo, Victoria, recently. My friend complained that there should have been a photo of Grace in each dress, so that we could see what she gave the dress. They did this with some. Her accessorising was so important too. Also, there were some that needed to show the back view clearly too - as you suggested could be done with a mirror (could be a lovely part of the display). Interestingly, it also was a V&A exhibition. Still - we did enjoy it! I was really disapointed too! I went with two of my friends and we paid for one of them to see it as a Birthday present, and were abit miffed that we had paid so much. We enjoyed the video projection they had and there were some beautiful dresses but the lack of information was an issue and I also thought that even though there were some lovely dresses the selection didn't really have the wow factor we were expecting. The new fashion gallery is looking wonderful. We ran out of time to go round it but it looks amazing, can't wait to go back and have a proper look.